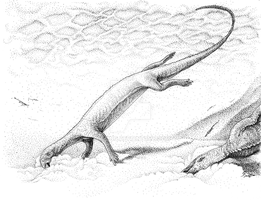 Here you are a scaled restoration between the two famous saurischians from the Oxford Clay. I've used mounted skeleton photos and the free Qilong's skeletals as references. I absolutely love that cetiosaurus. One thing about the Oxford Clay strikes me odd. That site was presented in Walking with Dinosaurs as a series of islands over a warm, shallow sea. Could those two species have been washed up from the mainland and died in England? Maybe. It's a hypothesis that can be tested with the hydrodynamics of fossils. They look great! I particularly like Cetiosaurus' color pattern.